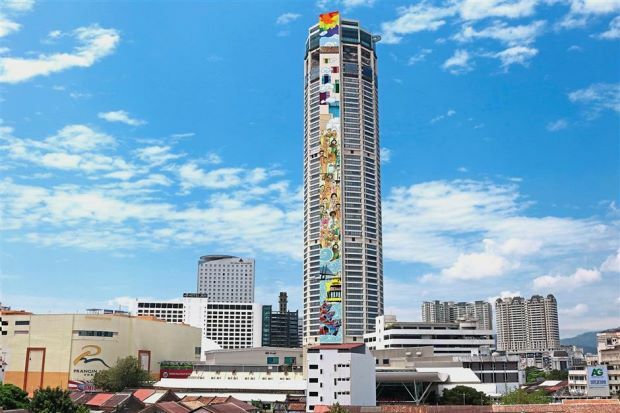 The iconic Komtar tower is set to earn a place in the Guinness Book of World Records with the world’s tallest mural. Five local artists have been engaged by Only World Group (OWG) to embark on the record-breaking feat starting from the middle of this month. Completion will take about six months. The mural will feature the essence of Penang such as the dragon boat, ferry, Penang bridge, portraits of Penangites, the architectural elements of heritage buildings, rainbow, sky and others. The artists — Bibichun, The Sliz, Kangblabla, Sattama and IMMJN — will work on a space of 3,000 sq m on the metal facade of what was supposed to be a bubble lift for the tallest building in the state. It will stretch to the top of the building, measuring 230m in height and 13.1m in width. OWG chief executive officer Datuk Seri Richard Koh said the project was in line with the company’s on-going effort to revitalise the state’s landmark. Koh’s listed company, which specialises in theme parks and tourism attractions, has invested RM200mil to come up with The Top@Komtar late last year. “With The Top@Komtar up and going, we hope the mural project will draw the eyes of the world towards this iconic landmark. “We hope to get endorsement of the Guinness Book of World Records for this attempt. “The current record for this category is 70m tall. 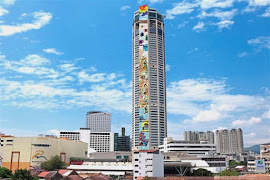 “Our mural will make full use of Komtar’s massive stature with a height of 230m,” he told a press conference to announce the endeavour at level 5 of the banquet hall at The Top@Komtar yesterday. OWG sponsored RM300,000 for this project supported by the state government. Nippon Paint will sponsor RM30,000 worth of paints. The five artists, famed for their street art, were handpicked based on their extensive experience in large murals in Malaysia as well as China, Singapore, Taiwan and the Philippines. Group leader The Sliz said the visual elements would feature four different parts, namely sky, architecture, people and sea. “All of us will be working simultaneously on the mural by standing on a gondola. “We will do some sketching before using Nippon Pylox spray paint as medium for our project,” he said. Chief Minister Lim Guan Eng, who was also present, hoped the mural would be ready by January next year.